The Doveridge combines diamond leaded glazing with other details such as the antique door furniture and profiled fascia boards to create an elegant and traditional looking garden building. This building is constructed from 12mm tongue & groove cladding over sturdy 50x38mm framing. An optional veranda is available in two different sizes for anyone who would like to add a bit of extra space to the front of the summerhouse, whether it be for decoration or to use as a place to relax during the summer. Two top opening windows on the front elevation combine with the double doors and two further side windows to provide light and ventilation to this popular summerhouse. The Doveridge Summerhouse measuring 10'x10' (3.04m x 3.04m) is a spectacular traditional summerhouse with antique style full length double doors and optional verandah or partition. Our Doveridge Summerhouse measuring 10'x12' (3.04m x 3.65m) is an attractive and well built, traditional summerhouse with full length double doors and optional verandah. 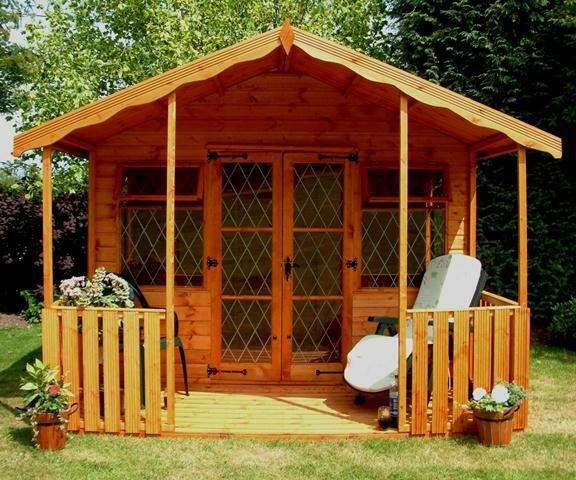 The Doveridge Summerhouse from Taylors Garden Buildings measures 12'x10' (3.65m x 3.04m) is a traditional summerhouse with full length double doors and optional verandah. The Doveridge Summerhouse measuring 12'x12' (3.65m x 3.65m) is a spectacular traditional summerhouse with antique style full length double doors and optional verandah or partition. The Doveridge Summerhouse measuring 12'x14' (3.65m x 4.26m) is a spectacular traditional summerhouse with antique style full length double doors and optional verandah or partition. Our Doveridge Summerhouse measures 12'x8' (3.65m x 2.43m) is a striking traditional summerhouse with optional verandah or partition and antique style full length double doors. The Doveridge Summerhouse measuring 14'x10' (4.26m x 3.04m) is a spectacular traditional summerhouse with antique style full length double doors and optional verandah or partition. The Doveridge Summerhouse measuring 14'x12' (4.26m x 3.65m) is a spectacular traditional summerhouse with antique style full length double doors and optional verandah or partition. The Doveridge Summerhouse measuring 14'x14' (4.26m x 4.26m) is a spectacular traditional summerhouse with antique style full length double doors and optional verandah or partition. The Taylors Garden Buildings Doveridge Summerhouse measuring 14'x8' (4.26m x 2.43m) is a spectacular traditional summerhouse with antique style full length double doors and optional verandah. The Doveridge Summerhouse measuring 5'x10' (1.52m x 3.04m) is a spectacular traditional summerhouse with antique style full length double doors and optional verandah or partition. The Doveridge Summerhouse measuring 5'x12' (1.52m x 3.65m) is a spectacular traditional summerhouse with antique style full length double doors and optional verandah or partition. The Doveridge Summerhouse measuring 5'x8 (1.52m x 2.43m) is a spectacular traditional summerhouse with antique style full length double doors and optional verandah or partition. The Doveridge Summerhouse measuring 6'x10' (1.82m x 3.04m) is a spectacular traditional summerhouse with antique style full length double doors and optional verandah or partition. Our lovely Doveridge Summerhouse measures 6'x12' (1.82m x 3.65m) and is a pretty, traditional summerhouse featuring two leaded top opening windows optional verandah. The Doveridge Summerhouse measuring 6'x14' (1.82m x 4.26m) is a spectacular traditional summerhouse with antique style full length glazed double doors and optional verandah or partition. The Taylors Garden Buildings Doveridge Summerhouse measuring 6'x8 (1.82m x 2.43m) is a spectacular traditional summerhouse with antique style full length double doors and optional verandah. The Taylors Garden Buildings Doveridge Summerhouse measuring 8'x10' (2.43m x 3.04m) is a lovely, traditional summerhouse with antique style full length double doors and optional verandah. The Doveridge Summerhouse measuring 8'x12' (2.43m x 3.65m) is a spectacular traditional summerhouse with antique style full length double doors and optional verandah or partition. The pretty Doveridge Summerhouse with antique style full length double doors and optional verandah or partition measures 8'x8' (2.43m x 2.43m) and is a spectacular addition to your garden.